The June 2017 meeting of the Nashville Area Beekeepers Association will be held on Saturday June 10th starting at 9:30am (check in will begin at 8:30am). Note this is on a Saturday and not our normal meeting day of the second Sunday of each month. 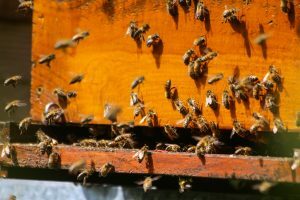 The event will be a “Field Day” with a number of hands-on “beekeeping teaching stations”, a BBQ lunch, door prizes, tours and live bluegrass music. Our host will be Trevor Qualls and Bon Aqua Springs Woodenware. The location is 10832 New Cut Off Road, Bon Aqua Springs, TN. In case of bad weather we will postpone to June 17th. Shop Tour and Woodenware Assembly (Allen, Amy and Gail Qualls) Showing all the shop production facilities. Demonstrating key equipment used in making woodenware and how to assemble frames & hive bodies. Show the various types of products in inventory at BAS and explain how orders are processed. Honey Extraction (Carey Mitchell) Honey extraction is demonstrated, using various types of equipment. Show and demonstrate all the various steps and types of equipment, starting with removing frames from the hive to bottling. Inspecting a Hive (Barry Richards) Barry will show the gear that people need for a hive inspection. An active hive will be opened and inspected, showing how to read a frame and evaluated the total hive. Those attending this station must, as a minimum, have their own veil. Pest and Disease Management (Pat Walsh)—Demonstrate how to do an Oxalic Acid treatment and use other mite control products. Also demonstrated will be beetle control, screen bottom boards, Nosema treatment, supplements, dealing with moths, recognizing foul brood, etc. How Do You Feed Bees (Mike Ireland) Demonstrate hive-top feeders, entrance feeders, making fondant, winter feeding techniques, use of pollen for feeding and making syrup. How to feed new colonies (nucs, swarm colonies and packages). Bee Friendly Trees and Plants (Ian Dawe) — Discuss and show bee-friendly trees shrubs and plants. Explain the food needs of bees. Review techniques for making your property more bee friendly. Provide literature on bee friendly plants. Schedule—Those attending can choose what teaching stations to attend and in which order. There will be a break at around 11:40 for lunch, picking up orders and listening to music. The program will resume at 1:00pm. The day will end with a “wrap up get together” and door prizes for all those attending. Invitees and Logistics—NABA members and their family members are invited along with guests are invited. We will also be inviting members from some local bee clubs in the area. Because of liability issues for BAS, we ask that children under 18 years old stay home. We suggest you bring lawn chairs, beekeeper protective clothing, sunscreen and if you like, things to drink (non-alcoholic). You will be asked to sign a personal injury waiver to protect BAS Woodenware. Meals—A barbeque will be held on site. Meals (BBQ sandwich, ribs, grilled chicken and drinks) will be sold at a reasonable cost. Attendees may also bring their own food and beverages, however, alcoholic beverages will not be permitted. Live Music—We will have live music during lunch with the Johnsongrass group performing. This is a group of very talented young people who play bluegrass music and have performed on the Grand Ole Opry. Advance Orders—For people wanting to order empty bottles for their honey from Kelley’s, Trevor will pick them up for you and have them available for pick up at the Field Day. You must both place the order before June 1st directly with Bon Aqua Woodenware (not with Kelly’s) using Kelley’s catalog numbers. Orders can also be placed for Bon Aqua Woodenware products ahead of time for pick up at Field Day. These orders must be placed before 5pm on June 8th at http://basprings.com/contact-us/ or by phone (931-670-6862). Door Prizes—Numerous door prizes will be provided by BAS Woodenware. Driving Directions— For your GPS, the location is 10832 New Cut Off Road, Bon Aqua Springs, TN. This is about a 45 minute drive southwest of Nashville.